From the peak of Mt. Schilthorn you have the best panoramic view of the famous Jungfrau massif including Eiger, Mönch and Jungfrau. 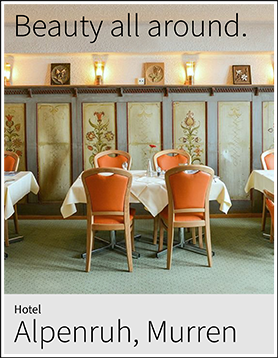 The revolving restaurant at Piz Gloria serves delicious meals while you gaze at more than 200 other mountain peaks. With good visibility you may see as far as Germany’s Black Forest in the north and the highest mountain of the Alps, the Mont Blanc in the south. The Schilthorn sits on top of the Lauterbrunnen Valley and is also famous for the James Bond movie On Her Majesty’s Secret Service. Visitors will find an interactive adventure exhibition “Bond World 007” on top of the mountain and the “Thrill Walk” at the intermediate stop Birg. In summer you will find an exciting hiking region; in winter the highest skiing region anywhere in the Bernese Oberland. Holders of a Swiss Travel Pass benefit from full coverage for excursions up to Mt. Schilthorn, Mt. Rigi and Mt. Stanserhorn. Many more mountain railways offer up to a 50% discount. If you are not already in Murren you would start the day with a train ride from Interlaken, Wengen or Grindelwald to Lauterbrunnen. The Schilthorn loop starts with the cablecar up to Grütschalp from where you finish the last stretch to Murren via Mountain Railway. Now you walk through the car-free village of Murren until you reach the cablecar. From here you ascend to Piz Gloria on the Schilthorn summit. You would return back to Murren and then descend via cablecar to Stechelberg, from where you take the postal bus back to Lauterbrunnen. 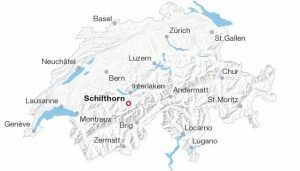 The minimum time to visit Mount Schilthorn from Interlaken is half a day (5 hours). However we recommend taking more time and making it a full day excursion. There is also an extensive hiking path network around Murren. 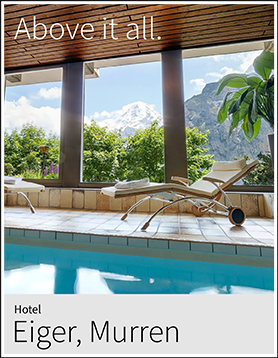 Many visitors of this fabulous mountain laud the 360° panoramic views, the 007 connections and the proximity to charming Murren. Starting in 2018 the excursion to Mt. Schilthorn will be included in the Swiss Travel Pass. Operates year-round, from Stechelberg in 30-minute intervals. Maintenance 1 week in early spring, 3 weeks in late fall. Make sure to keep up with the weather and dress in layers. Note that it can be windy. Make sure to bring a wind breaker and be prepared for sudden change of weather. Bring sun glasses, a hat and gloves in the winter. Good walking shoes recommended. Mount Schilthorn is located in the Bernese Oberland. It is 66km/41 miles from Berne and 12km/8 miles from Interlaken. Interlaken is 1.5 hour by train and to Berne it takes 2.5 hours.